As part of a project I’m working on here at Axosoft, I’ve been producing tiny SVG animations. I use Sketch to produce SVGs that I then bring into my HTML and animate with CSS. I’m going to share my process, with examples, so you can follow along to create your own animations without too much math-headache. Ensure that you have uniquely named the layers or objects that you intend to animate. This will make things much easier for you, as you’ll be able to quickly find those elements in the SVG code and easily reference them in the CSS. It’ll also ensure that they don’t get merged into one path by the SVG optimizer we’ll use later. 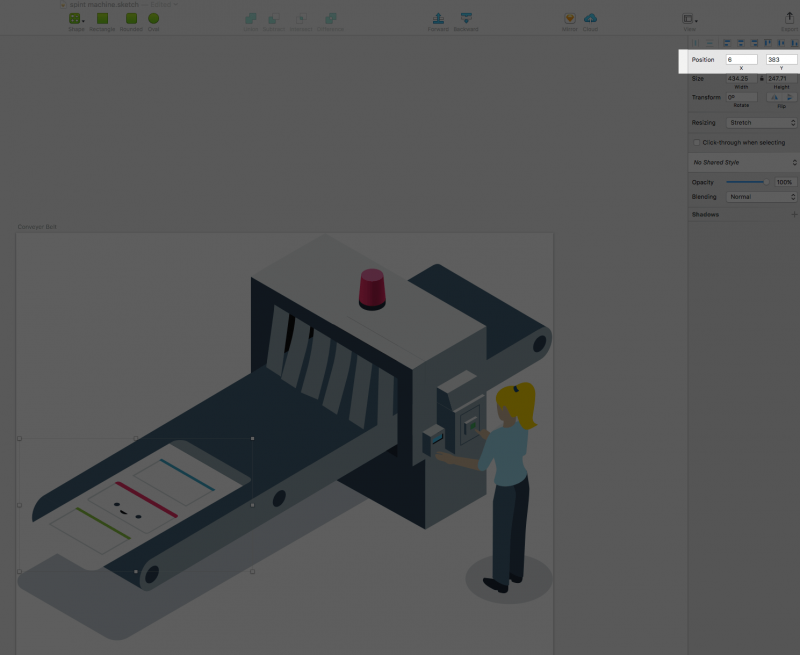 We are not going to work with hiding/showing elements of the SVG in this article but remember that Sketch will not export hidden layers, so even if you intend to hide a layer at the outset, you’ll need to have it visible in the export and hide it with CSS later. Group all your layers into one wrapper layer. This is the layer we’ll export. Now, you’re ready to export your SVG! Select the layer into which you just grouped your items. In the bottom-right corner, click Make Exportable and select SVG as your format. Click Export and Save. Sketch writes pretty nice SVG code, but it is possible to optimize the code a little to save some valuable KBs. As we all know, less KBs will help with faster page rendering. There are several options for SVG optimization. The SVGO GitHub page is home to a Nodejs-based optimizer but also lists several variants for other needs, including a web app version, SVGOMG, which we’ll be using here. Go to SVGOMG and upload your image. Once uploaded, you can change your optimization settings and it’ll rerun in real-time. I have selected most of these options, including the Multipass option, but I have left the Clean IDs option deselected (that’s important! ), as well as the Prefer viewBox to width/height and Shapes to (smaller) paths. When exporting SVGs, Sketch positions elements using the transform attribute, which is accessible by CSS3’s transform property. This is pretty cool; it means you can manipulate your objects in Sketch, reference their new transform properties and use that in your CSS code. This is why the Shapes option above is not selected, as it would remove those attributes. Back to our SVGOMG cleanup, and there’s a download button in the bottom-right of the UI that also shows how much smaller the file size has become through its stripping down of the code. In my example, it’s saved a decent 36.6% – nice! You can download your new, leaner SVG file, but for this example, it’s easier to copy the code straight to the clipboard by clicking the button directly above the download button. In this example, I’ve added a little CSS to tidy things up, but apart from that, nothing is affecting the inline SVG code directly at this point. In the image below, I’ve highlighting the bounding box of the groups/objects I want to animate. Now it’s time to actually animate some of the SVG elements. We’re going to have the sprint card move down the conveyer belt, and the ribbons are going to flick just a little for a more realistic effect. Going back to our Sketch document, we can see that the card is situated at 485, 99 (x, y). Moving it down to our desired finishing position puts it at 6, 383. If Sketch has not exported these values as a transform attribute (which it doesn’t always do), we can treat them as 0, 0. We can now go to our Pen and add a simple bit of CSS to see how easily this transformation translates into CSS. Now we’re ready to animate! Next, we modify our CSS to apply the transformation to the sprint card element, only when it has an active class. Time to rotate those ribbons! We can now repeat the approach we took above. However, this time, Sketch has not carried over the translate values. This sometimes happens, but it’s not a total bummer. We’re just going to apply some arbitrary transformations in our Pen to eyeball the results. This plots our rotation at the upper-right corner of each element. And here’s the finished animation! Have you created any cool animations using SVG/CSS? Tweet us your Pens, Fiddles, etc.! Zero Staging Areas, One Staging Area… n Staging Areas?